At home or on the road Saddle Shop Leather is the best in Town! The King Ranch Saddle Shop continues to practice what the early saddlemakers had learned. In materials, only the best is good enough, and in styling, simplicity has its own elegance. The land of King Ranch is incredibly harsh. The mesquite thorns and brush of the chaparral pierce and tear all but the toughest leathers. The tanning had to be perfect on the cowboy’s equipment or the gear would disintegrate under the pitiless sun and humidity of South Texas. 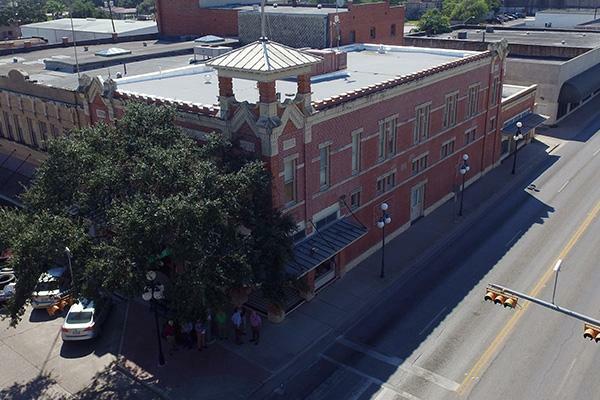 Today, King Ranch Saddle Shop, located in Kingsville, Texas, resides in the John B. Ragland Mercantile Building which is listed on the National Register of Historic Places. Built in 1909, the building housed the most preeminent department store south of San Antonio for seventy years. Now after a meticulous restoration, the historic building once again bustles with trade. At this time, however, it is home of the King Ranch Saddle Shop. Here you can see third and fourth generation Kinenos (literally, the people of King Ranch) working in the same manner that they have for over 100 years, continuing a tradition of service and supply. In the spirit of this tradition, you will find new products, old favorites, a few anecdotes on King Ranch history, and a variety of photographs taken on the Santa Gertrudis, Laureles, Norias, and Encino divisions of the King Ranch. The hands have changed, but the techniques, craftsmanship, skill, and pride are all the same timeless quality that King Ranch has been long known for.